We were going to call this "Awesome Dead Thing of the Month," but let's be real: creating a "monthly" event is just going to end in disappointment for all. So here we are instead, scrounging for titles and trying not to commit to a temporally-set re-occurrence (DON'T BOX US IN), and the first one we're going to talk about is Macrauchenia. Yeah, it sorta looks like Dumbo got teased one-too-many times about the size of his ears and went to visit Michael Jackson's all-natural-plastics doctor, or perhaps a llama got too invested in sniffing at a tube sock. 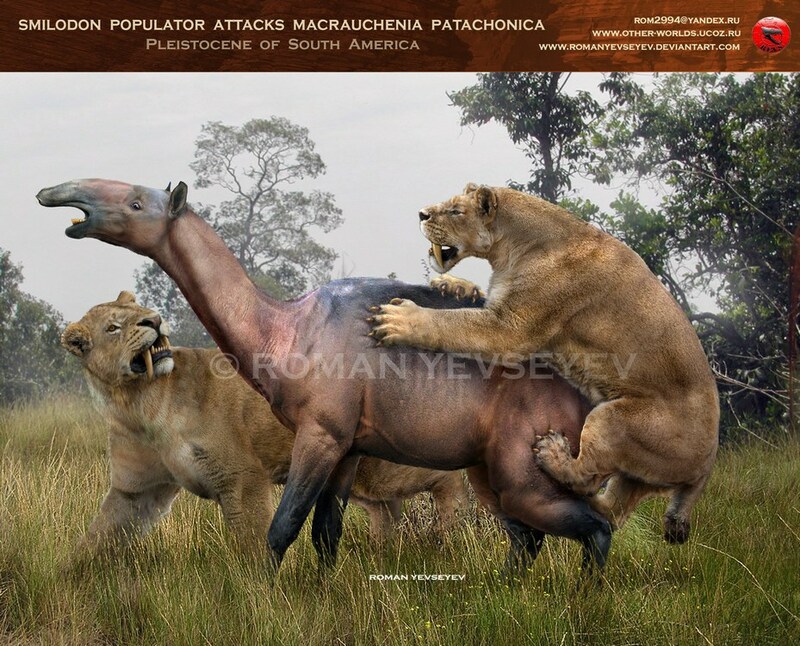 But of course, as is ALWAYS THE CASE IN PALEONTOLOGY, Macrauchenia was related to neither of these. Macrauchenia had to be unique, its own special flower, and belong to a group of organisms known as the Litopterna. Never heard of them? Yeah, it's because they're dead. 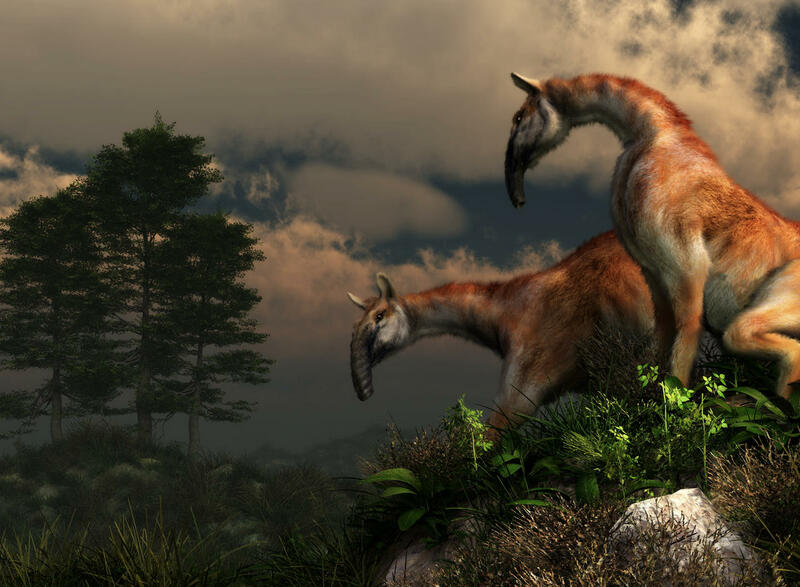 Litopterna is an extinct order of fossil mammal ungulates from South America that lived during the Tertiary period. Macrauchenia represents the youngest known genus of litopterns and was the only one to survive the Great American Interchange before dying out at the end of the Pleistocene. The first specimen of Macrauchenia was discovered by none other than Charles Darwin on that little cruise he took on the Beagle. But back to that beautiful proboscis. How do we know (or hypothesize, at least) that they had a trunk, let alone that dashing, sleepy-eyed expression? It's all about the bones, guys. Yeah, it looks like a mammalian Diplodocus, because its nasal opening is all the way on the top of its head. Paleontologists look at bones like this, get confused for a while, then decide that an animal is enough like another modern animal that it probably looked the same with skin on it. 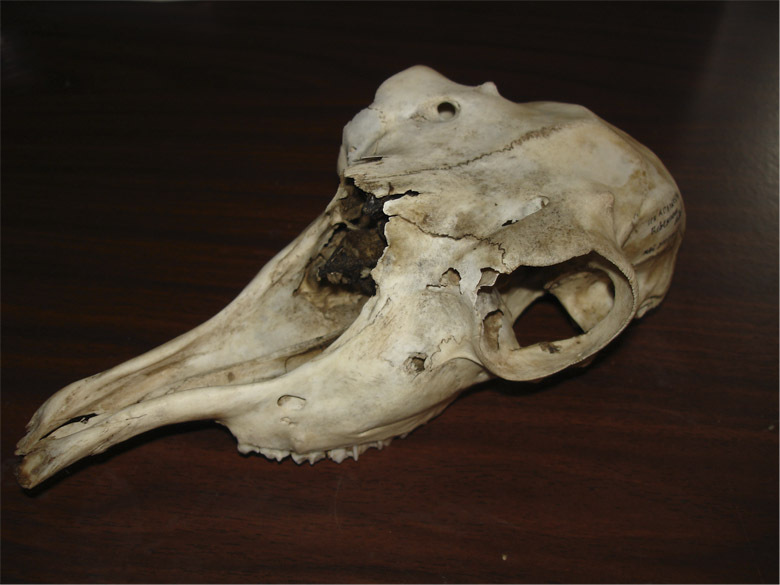 So this here is a skull that has the nose bones way on the top of its head (known as "nasal retraction" in science-y circles), which is sort of like Tapirs, Elephants, and Saiga. Internet!!! What the hell, man??? Obviously this is just a picture of an animal getting skewered, erm, we mean killed by... oh for God's sake. Seriously? We give up. We just give up on the internet for the day. Clearly nothing good will come from it. Psst. You should really follow us on twitter, or friend us on facebook, or write us an email sometime. Maybe you have an awesome dead animal you'd really like to know more about slash see scandelous drawings of, huh?